In my new job as a children's librarian I am fortunate to have many new picture books cross my desk each week. While there are many that I like, there are few that I fall head over heels in love with. 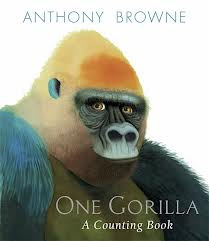 One of the few that has captured my heart recently is One Gorilla: a Counting Book, a new release by Anthony Browne for Candlewick Press. Anthony Browne has long been a favorite of mine; the internationally renowned author and illustrator is a former British Children's Laureate and is especially known for books about monkeys and primates, among my favorite animals. But I don't hesitate to say that this new release is his most striking book ever. Indeed, this is one of the most stunning picture books I've seen this year. 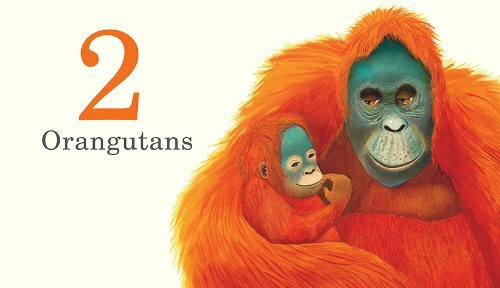 It's an oversized picture book, with brightly colored paintings of our primate cousins, including the well-known (gorillas, chimps, orangutans) and the lesser known (macaques, colobus monkeys). Browne's artwork is at once highly realistic and almost photographic and also fanciful, with a palette that exaggerates nature's colors. All of the primates are looking directly at the viewer or reader, connecting with us in an extraordinary way. The book ends by explaining that all these animals are primates..."all one family. All my family....and yours!" The book ends with a double page spread of humans from all different cultures, all colors and nationalities, stressing our commonality with our primate cousins. Below is an example of the gorgeous two-page spreads from this book. Don't miss it! I just read it yesterday at the book store. Gorgeous!